One in a series of stories from the Kansai region of central Japan. Heads up, guys, White Day is next week, and you don’t want to be caught empty-handed in front of your sweetheart. What’s that? You’ve never heard of White Day? To be fair, it’s basically a manufactured holiday, as many are – Secretaries’ Day anyone? – designed to sell stuff, in this case sweets. Here’s the gig, as it goes in Japan: on Feb. 14, ladies across the country customarily give Valentine chocolates to many of the men in their lives. Not necessarily romantic offerings, these “giri-choco” or “obligatory chocolates” are given to male co-workers and acquaintances. The Absolu (525 yen) is chocolate and creme brulée with hazelnut creme. But then, there are the candies that carry a weightier Cupidian connotation, and that’s where it all gets a bit sticky, so to speak. Should a young lady have designs on a particular fellow, her gift of Valentine candy comes with the implication that she’d be pleased as pudding if he reciprocates on White Day, which comes a month later on March 14. Should the gentleman present her with some substantial sweets on that occasion, a romance may very well be blossoming. If not, a sour taste might be all that remains. According to some sources, White Day came about – not surprisingly – in the late 1970s, when a Japanese candy maker produced marshmallow treats for the occasion, after the National Confectioners’ Industry Council suggested creating a holiday to bookend Valentine’s Day. Soon, there was white chocolate and other lightly-colored treats, which, when complemented by scarlet Valentine offerings, were in keeping with the national concept of “kohaku,” the combination of red and white symbolizing balance, health and prosperity. If you happen to be in Kobe, though, you’d be wise to take it fairly seriously. The word around town there is that White Day was begun locally by a Russian confectioner, in response to St. Valentine’s Day, and they’re very proud of the sweets available around town. 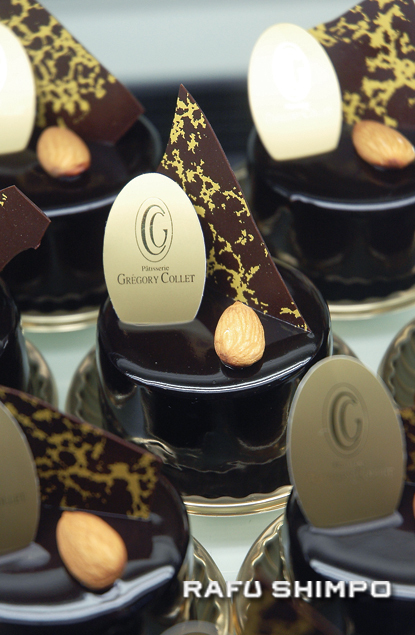 Last month, I had the chance to visit the Patisserie Grégory Collet, a French-style cake and sweet shop in Kobe where the quality of their creations is uncompromised. 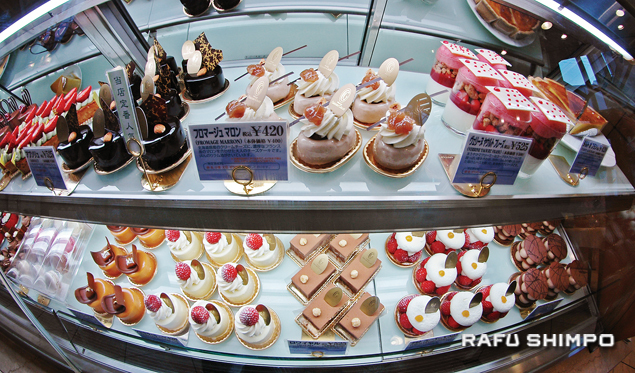 Opened in 1990, the shop features an array of cakes, chocolates and frozen desserts, but from what I observed, their artistic, single-serving pastries are the items most come for. The Framboisier, with its strawberry mousse and subtle pastry wrapped in a fruit gel, was as tasty as it looks. Come to think of, it was way tastier than it looks. Among those I sampled were the Framboisier, a tasty little hunk of strawberry mousse and subtle pastry wrapped in a fruit gel and topped with berries. Pity you’re merely reading about it, because I assure you, it was heavenly, worth every yen of the 473 yen price. Also absolutely divine is the Absolu (525 yen), a chocolate brulée with hazelnut creme. Lunch is available as well, based around pastas, sandwiches and French fare. 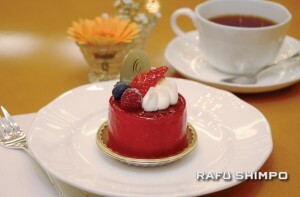 Despite the luxurious desserts, the meals are quite reasonable in price, around 900 to 1,700 yen per person. Patisserie Grégory Collet is located at 3-4-7 Motomachi-dori, in the Chuo district of Kobe City. It’s about a five-minute walk from Motomachi Station. Open 10:30 a.m. to 7:30 p.m., except Wednesdays, when it is closed. Phone (078) 326-7511 or visit www.http://www.gregory-collet.com.